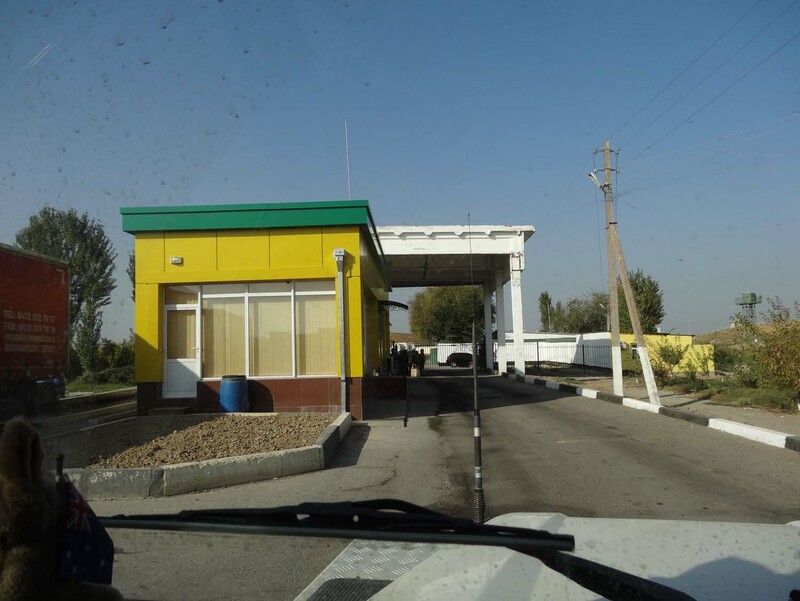 This is the route we drove in Uzbekistan. If you are interested, you can click on this image below and it will take you to the actual Google Map online. You can then zoom in (or out) to have a more detailed look. 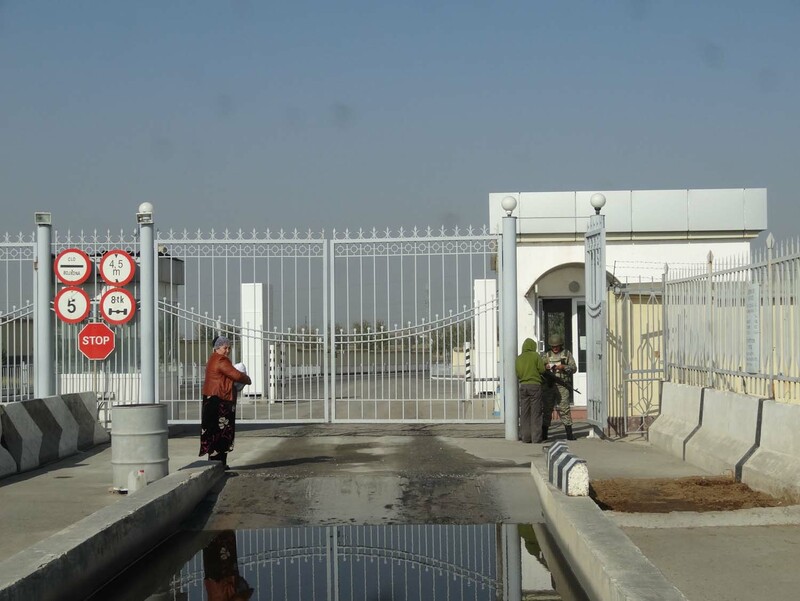 Please read about this border crossing on the Turkmenistan country info page. The gate was closed, most people walk through this border, but was opened for us as soon as we arrived. It’s a short drive to the undercover area where we were told to stop. Right in front of the undercar-checking area. 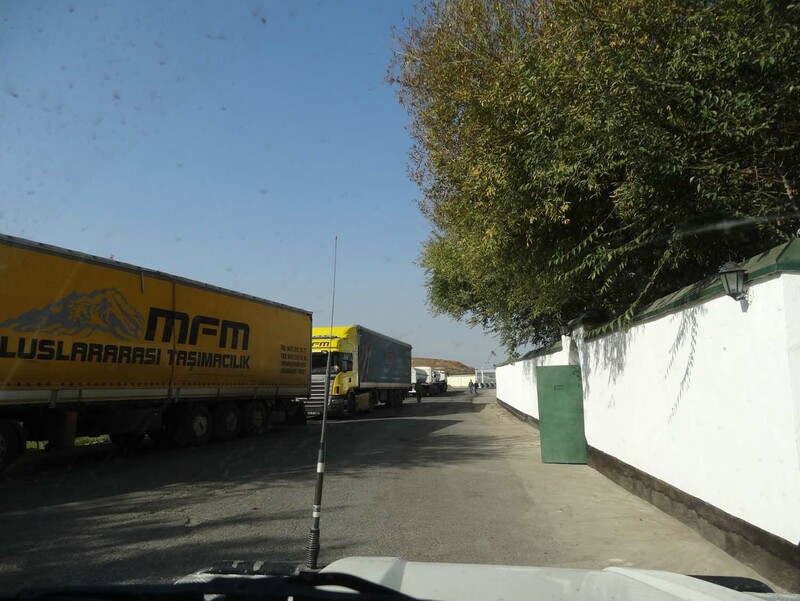 We first entered the first office on the right hand side where we handed in our temporary vehicle import papers. As we had a blank form from Kyzyl-Art and an original form from Khorog they had a bit of a chat about it, then entered the details into their big official book and we were sent on. They kept the papers. Next stop was an office on the left, the second one counting from where the car was parked. He wanted to see our passports and wrote stuff down in his big book. Then a guy emerged from an office inside this office, the transport officer it turned out, asking for our ‘karta’. Maybe we didn’t pay the $20 for no reason? We handed him the map with route planning and other paperwork attached to it and he disappeared into his office. After the guy was done with our passports he sent us over to the transport officer, but when we walked into his office he just looked at us and sent us on our way. I guess he had what he wanted so he was happy. Outside we were told to jump into the car and drive on to the immigration building just before the gate to no-man’s land. They never looked inside the car. There was a little queue of foot passengers crossing so we joined them. Halfway through the queue the immigration officer wanted our passports and our car registration paper. And then he shut his window and we waited. It took a little while, but then we were handed back our passports, the gate was opened and we were in no-man’s land again. 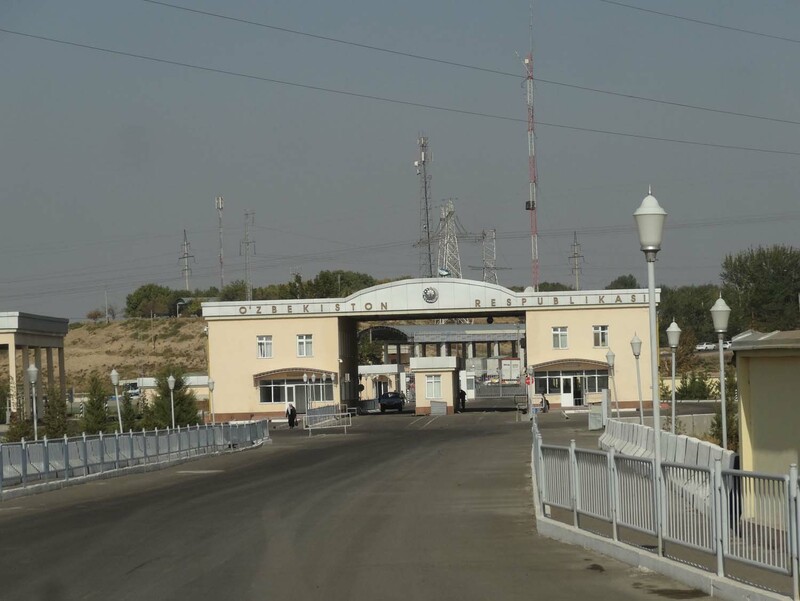 The Uzbek side looks a bit more officious with the armed guard. We had to stop before the gate and walk inside with our passports and car registration paper. 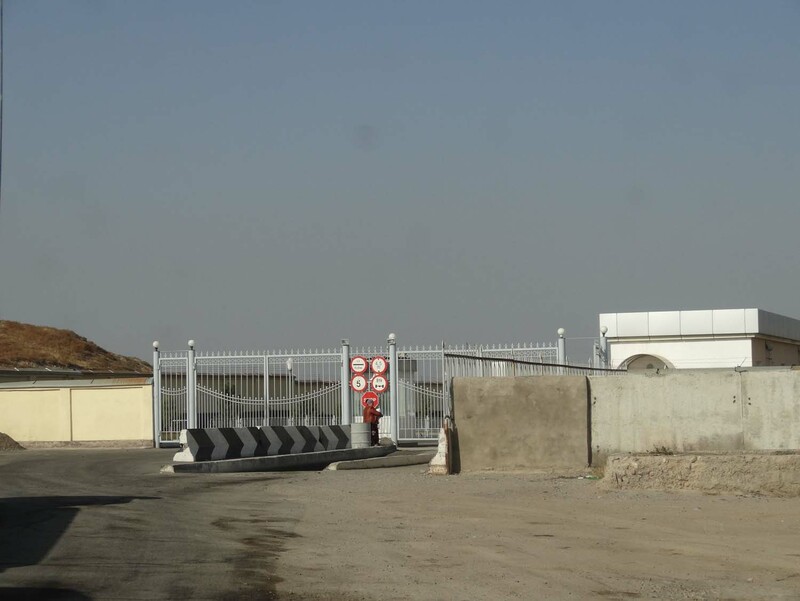 In the first office on the right paperwork was filled in again, another big book, and then I was told to pay $5, 30 Tajik someni or 12.500 Uzbek som. Turns out we are paying again for the sheep dip, a disinfectant we have to drive through. Foot passengers walk through a sandpit, not sure if they have to pay something as well. Before I was able to go to the car and get the $5 another man indicated I had to come into his office. The door was shut and he got out his big book after asking for the passports. A game then started with him sending me away, after asking for $5, and me saying he had to write down the details in his book. Eventually he wrote them down and I was sent on my way. No money had to be paid. Back in the car we drove through the sheep dip and tried to drive off without paying the $5 for it, but got shouted at. We drove back and paid the $5. One can try right? The next stop was just before an undercover area. We parked the car and went inside, in the building on the right hand side. First you go through immigration which was a smooth and quick process. Then you automatically enter the next area where we were told to fill in a declaration form. 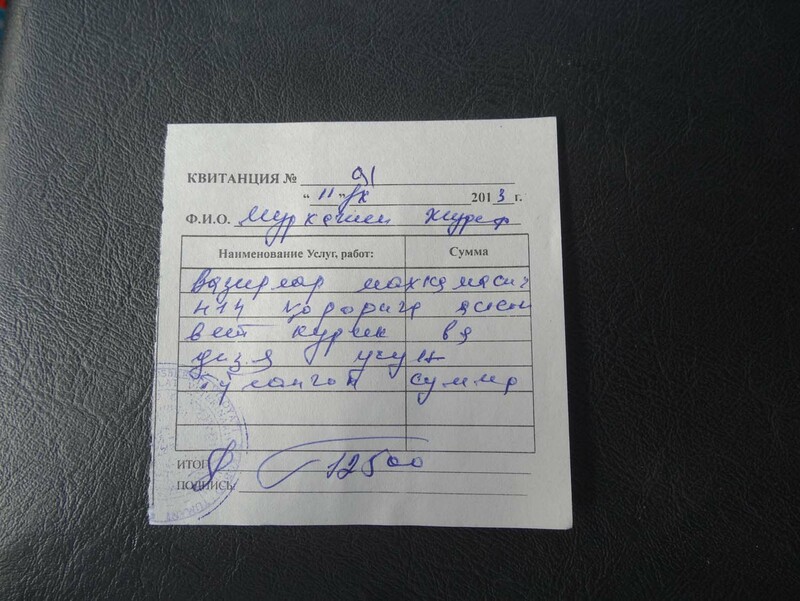 There are only forms in Russian available in the box, but eventually they got some English forms for us. We were given 2 each. The most important section on this form is how much money you are bringing into the country as you are not allowed to leave with more money than you came in. We thought one of us would fill in the money and the laptop, the other the car and the phone (under communication). All good, but they wanted us to spilt the money. Didn’t have to be even, but just split it over both forms. This meant filling in some more of them as you’re not allowed to make corrections on the form. Once the forms had been filled in you can join the queue. The officer puts some stamps on both of them, lots of scribbling and you get one back. The other form is passed to the guy behind him, together with your passport. He enters details into his computer and the locals all seemed to be led into the individual questioning room for a pad down. We just waited for our passports to come back and we were off. Off to the next stop that is, our temporary car import papers. This had to be done on the other side of the undercover area (looking from the car, at the far end on the left). Jon had already started the procedure and by the time I joined him, they were just asking to see some insurance documents. We showed them the comprehensive insurance documents, not sure where you would have been able to pick up third party insurance. We didn’t see anything where you might be able to buy insurance. But they were happy with what we showed them. It still took a long time, they made copies of our passports, the car registration paper and our visas and wrote whole stories on the back of them. But eventually we were given 2 forms to sign. We had been given a temporary import document for the car for a month. 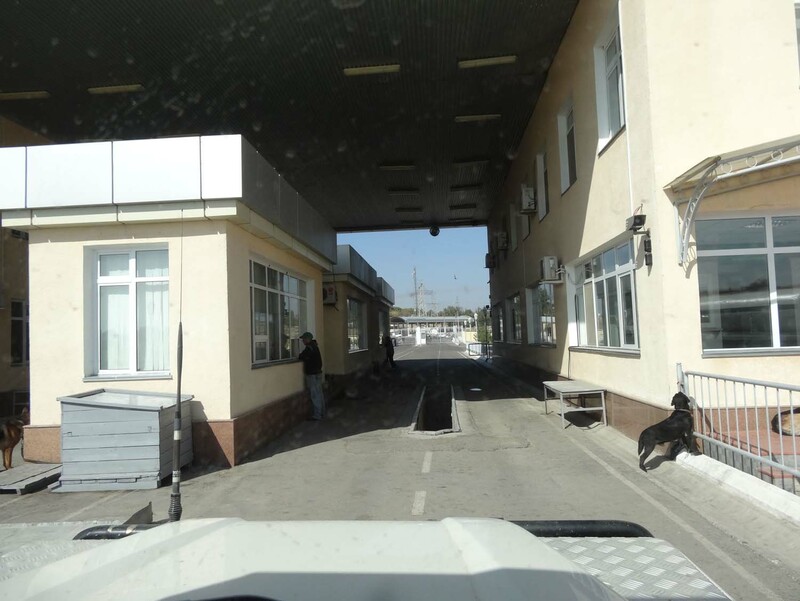 Now all we had to do was go through customs control, they were at the first office on the left as seen from the car. They weren’t in there when we looked, but somebody was soon found to go through the car. He was very thorough, but put things back, or allowed us to put things back before opening the next drawer or box. He even wanted to look underneath the driver’s seat (where the electronics are for the car in a Defender). He took most interest in the medicine box, probably looking for headache tablets with codeine in them, but we don’t have any of them so we were all good. Soon we were told we were good to go. You then drive to the last gate, through the undercover area. At the gate the officer just checks if you’ve got a stamp in your passport and then the gate was opened. We were in Uzbekistan. It had taken us about 2.5 hours to cross the border. 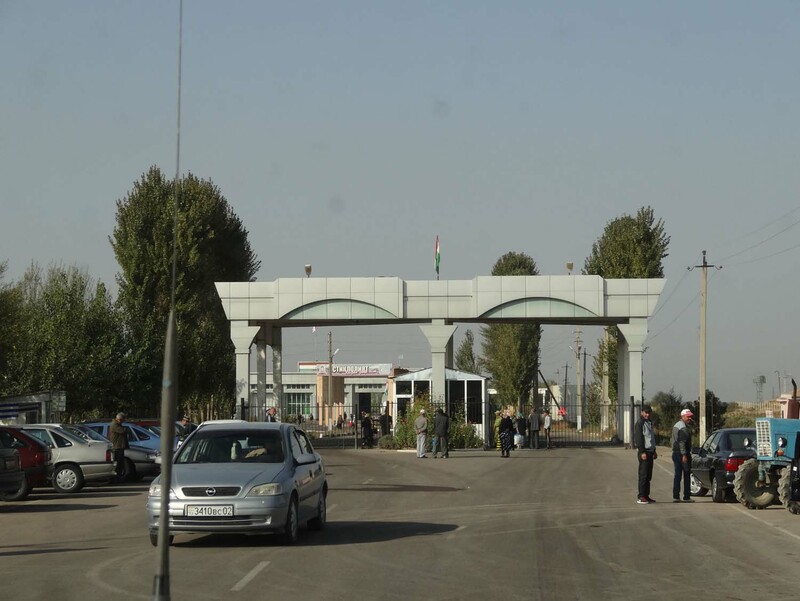 About 45 minutes on the Tajikistan side and 1.5 hours on the Uzbekistan side. Not bad at all. You can find bread, vegetables and fruit in the local (little) shops and on the bazaars. So cooking yourself is no problem. Things like pasta, milk and jams are readily available. Our love of juices continued in Uzbekistan with any combination possible and even the tiniest shop and restaurant selling at least a few varieties. The fact you get a liter of juice on the table in a restaurant when you order a juice is fantastic. Cherry and grapefruit juice are still our favourites, but also some of the multi fruits or combinations like banana and strawberry are very popular. For us the roads in Uzbekistan were the best we have encountered yet in Central Asia (coming from Kyrgyzstan and Tajikistan). All major roads are tarmac, some brand new double laned, divided highways. Even the road to Monyaq (the Aral Sea) is good, very good in places and from Nukus it only took us 3 hours to drive there. 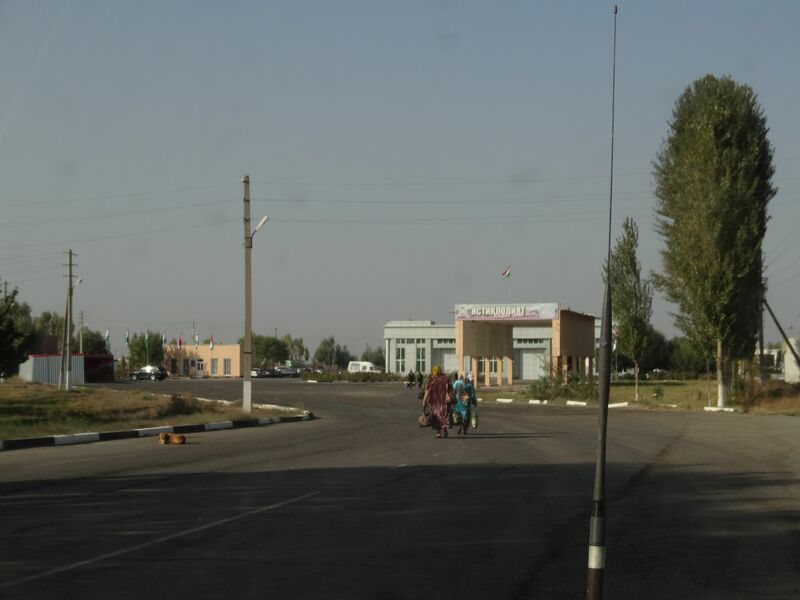 Samarkand to Buchara took us 5-6 hours which we thought was pretty good. Now this is tricky in Uzbekistan, especially around cotton harvest time in October and November when diesel gets even scarcer than it normall already is in this country. We checked with many petrol stations if they had diesel, but most had none. However, we did find that people generally knew if there was any in the area and where we would be able to find it. Once we even found it at an actual pump where we only had to pay 1000 som more than the official price listed on the pump (1705 became 2700 per liter which is a dollar on the black market in October 2013). Do not change money at a bank, do not take out som from an ATM (to be honest we didn’t even see one ATM, they might be there but we didn’t notice any) and ask around before you change your dollars or euros. Both are handy to change, we had dollars and the official rate from the bank was around 2100 som for one USD. On the black market we were able to get 2700 without any problems (harder in Samarkand where we struggled to get more than 2600). So simply said, bring enough cash for the duration of your trip, it’s the easiest way to pay for things. Most people also accept hard currency to pay for things like restaurants, hotels, souvenirs and fuel. But you can get a better deal sometimes if you pay in som. 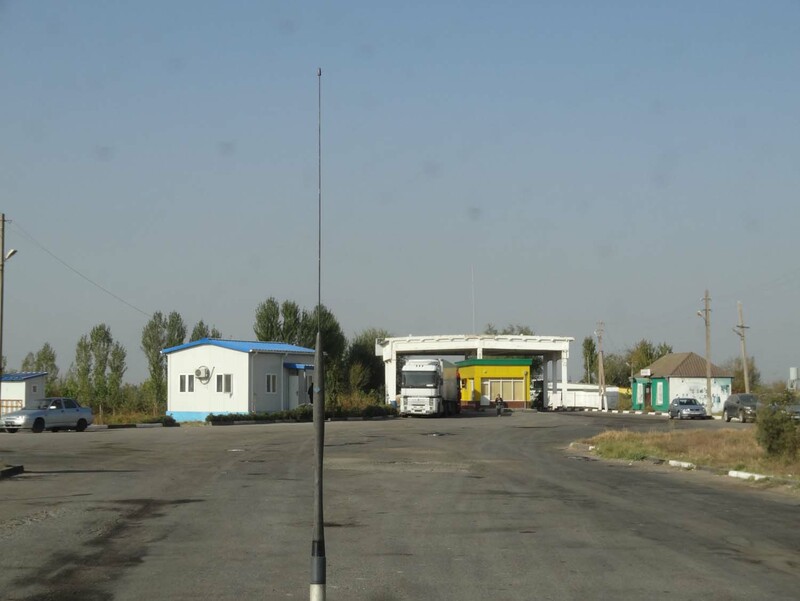 When we arrived in our first hotel in Samarkand we asked the lady where we could buy a local sim card and she told us we couldn’t buy one unless we have a Uzbekistan passport. As we’re only here for just under 2 weeks and we’ll be staying in hotels most of the time (with wifi), we decided not to even try. We did see a lot of advertising for Beeline and Ucell, I would give one of those 2 a try if you need a sim card. We ended up applying for our Uzbek visa in Almaty, which was good but an absolute nightmare to get into and out off the Uzbek embassy (coordinates for the Uzbekistan embassy in Almaty: N43 15 39.2 E076 57 47.9). All the information we had read so far on the internet told us we needed to be at the embassy before 2pm at which time they open for visas. When we arrived we were told they wouldn’t open until 3pm. When we came back around 2.30pm there were lots of other people, including locals waiting. When the consul arrived he struggled to get through the gate, but once through he allowed people to ask questions. We waited until most of the shouting had subsided and asked if we could apply for a visa today. yes, no problem was the answer in perfect English, just wait. We did, and about 40 minutes later (3.40pm) he was back at the gate and allowed us in. We had filled in the application form online (one each), had printed them and attached a photo. We also needed a colour copy of our passport as that is what you leave there, you can take your passport back with you. You also don’t pay when applying, instead you pay when you pick it up. We asked for urgent processing which means 5 days (we were there on a Monday, we could pick up on Friday). In the end we applied for other visas as well and decided to go to Kyrgyzstan for a hike before picking up all visas at the same time, so we could have just asked for the normal processing, but we didn’t know that at the time. 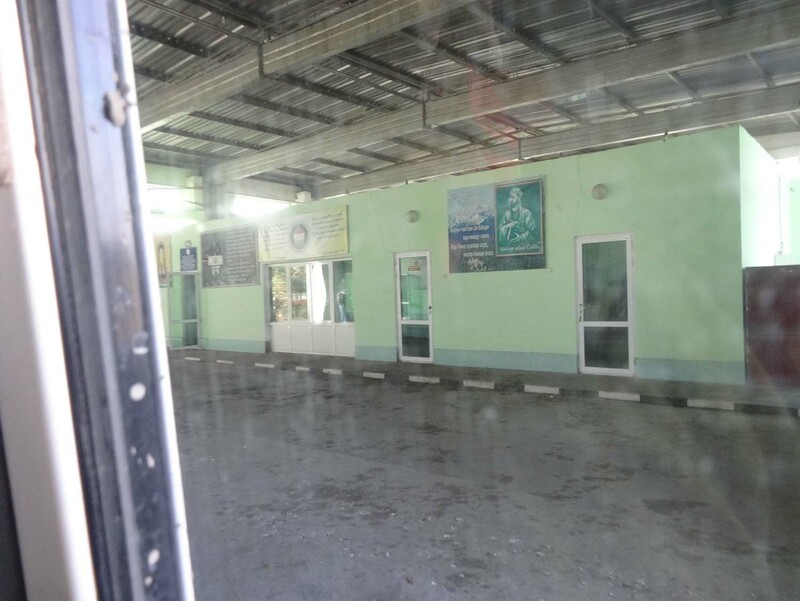 When we returned to pick up our visas it was the same hassle to get inside the building. You then hand in your passports and are told to wait. This can take a few hours depending on how busy it is as they are super disorganised. Instead of handling each person one by one, they just throw all passports on a big pile and only after doing other things (?) will they start processing the passports and visa applications. Leaving the Uzbekistan embassy was as hard as getting inside, but eventually we were standing outside, the proud owners of 2 new visas. 1. A passport or a stateless person’s document, the expiry date of which must exceed the visa’s period of validity not less than 3 (three month). 2. 2 (two) copies of duly completed visa application form (fill in a form). 3. 2 (two) recent passport-size photographs (3х4 cm.). Attach photographs to your application forms. 4. Copy of the invitation letter confirmed by the Ministry of Foreign Affairs of Uzbekistan. There is a simplified visa procedure for the citizens of Austria, Belgium, Germany, France, Italy, Japan, Latvia, Malaysia, Spain Switzerland, the United Kingdom. 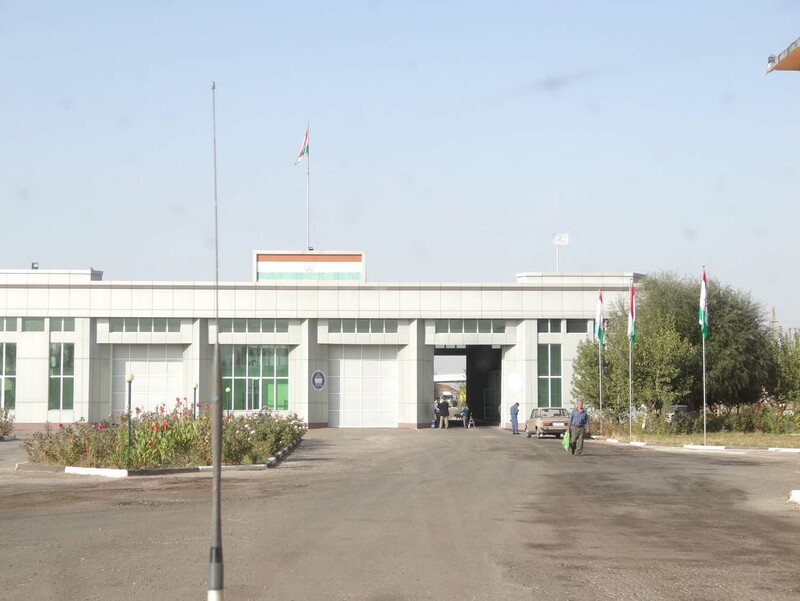 Businessmen of these countries are issued multiple entry visas up to one year and tourists – up to one month, additionally, they do not require to submit to the Ministry of Foreign Affairs Visa Support Letter of legal entity or private person in Uzbekistan or tour-voucher. After calling the embassy in Singapore, we have agreed to apply for our visas and pay for them, but not send our passports over to receive the actual visa. Instead we will pick up the actual visa when we arrive in Singapore at the start of our trip. By using our UK and Dutch passport we don’t need LOIs.